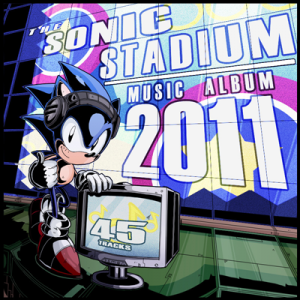 The Sonic Stadium is proud to present it’s first official community release project – The Sonic Stadium Music Album 2011. Assembled in a span of two months, 16 budding musicians on the SSMB banded together in an effort to bring out the ideas and concepts of our creative community at TSS. What was once a mere collaborative mini-album with a 15-track estimate, as envisioned by forum member and project leader VizardJeffhog, grew into an unmediated storm of tracks and tunes, something we hope will be the first of the many future community-driven projects to follow at TSS. 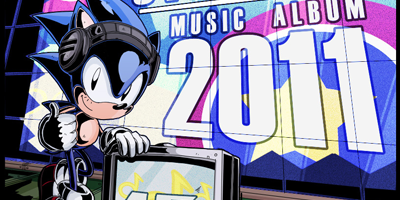 With 45 tracks, the album spans 4 discs with roughly 2 and a half hours of remixed Sonic music from games both well known and obscure – including some original Sonic-inspired tracks! Covering a wide variety of acoustic, electronic, rocking and atmospheric music, each composer on this album has done their best to bring out their respective visions of what the Sonic series has often been recognized and defined by – it’s music. The Staff of this project would like to extend it’s special thanks to Ian Bennett for joining in on the project and expanding it by creating the feature site hosting the album. The Staff would also like to thank BlitzChris for doing a pre-release stream as part of SEGASonic: Radio’s final show prior to their upcoming reboot. Finally, we thank all the artists and musicians who helped contribute into making the album what it is today. It has been one wonderful experience. As this big feat is reaching the end of it’s long and exciting production, what’s next? We can formally announce that we’re in the plans of assembling an even bigger and better album for 2012. While we won’t dwell into the details of this future project, starting today we will be accepting contributions from other fans who wish to have their works featured for what we’re hoping can become a bigger and better album. If you are interested in being a part of this, keep an eye out on the SSMB and contact the project leader, VizardJeffhog, for album submissions and details. For the fans, by a bunch of other fans, we have all enjoyed working this album, and we sincerely hope you enjoy listening to the album just as much as we had making it! Next Post > Next post: RUMOUR: Sonic & SEGA All-Stars Racing 2 to Feature Green Hill & Casino Night Tracks? Finally, the wait is over! The SSMB Album is released to fans everywhere, who can enjoy a great collection of awesome tracks remixed by SSMB’s finest! Hell yes! It’s finally out! I listened to the first few tracks while it was downloading. Sounds great! I’m kinda surprised I didn’t see any Colors songs though. …you’ve just unleashed a colourful idea upon me. So…2012 album will have Colors music? Well. (and I’ve mentioned this before) I’m going to be Re-Editing & Re-Mastering all my submissions for Single Release in the future. There are 2 trax that didn’t make the cut this album based on votes by the other artists. 1 is actually finished. – It’s an Oldschool Rave / Jungle remix of Jeh Jeh Rocket based on my Remix from the SUPER SONIC KNOCKOUT Release. The other is a Colors Mashup of NEARLY every major stage theme that is only about 75% complete…And Unless I release it on my own (possible) It may make it’s way into next years album. Ok DJ Ear looking forward to it! That Ice Mountain Act 1 remix was a pleasant surprise! Big Up all the fellow artists who helped contribute and make this an AMAZINGLY fun experience full of incredible talent & even MORE incredible music! Hell yeah! It was great being a part of this project, and I’ve really enjoyed all of the feedback and community interaction from this album throughout the months. I absolutely love every single track in this album. Great job everyone! I absolutely love this album – everything from concept to execution is top-notch, and this really is competing with some of the big remix projects out there. This project has been nurtured by Jeff and his gang right from the beginning, and it really shows. An amazing result – one I hope both the community and artists are pleased with, and a real shining beacon demonstrating what this community is capable of. Amazing work guys, im loving each piece! Hooray! Finally its out :D!! I wanna write somethin for the next album! This is great! I absolutely love the Unawakening Float Remix…that song is one of my all time favorite songs hands down. Lava Reef…good choice….Ice Cap…Death Egg Robot…oh my too many to mention here…Well done guys…Love it…Remixes are always a big time plus…and I’m a mega fan of Boss Musics too lolz. Amazing work! Ive only listened to the first disc, but I am very impressed so far! Really like the Red Mt. remix from SA and the Endless Mine one is fantastic! Thanks to u guys, I’m not going thru Sonic music withdrawl, since I still dont have the Generations OST. Any word on an iTunes release by chance???? There is a lot of static noise in the background of most tracks. It’s quite noticeable especially when the songs change. Not a huge issue for me just annoying lol. Album is good, loved that Underground remix! These are really good remixs. Nice work. Not bad, but most of the tracks are seriously lacking. The classical/orchestral ones are nice and somber, but lack the background instruments to really keep the whole thing flowing. The rock and techno songs tend to have more problems; The rock tracks do a good job of intensity, but there’s no background melody, which leaves the main melody and riffs sounding slow and a bit dull. Most of the techno tracks lack any intensity that they should have. There’re no crescendos or decrescendos, very few background melodies, and even fewer synths used. Overall, for almost every song on here there’s just no backbone to them; No extra instruments or backups or variation in intensity. I do give props for being to put out so many tracks, but I’d rather get a few great tracks than many lackluster ones. Overall I’d give it 5.5/10. Not bad, keep trying, don’t stop. Listening now. Good stuff so far. I’m a fan of the Star Trek computer sound effects in Atomic-Tronic. Uhh it was Endless Mine? Mixed with 1000 Miles by Vanessa Carlton. You’re so close – it was uploaded in 2003, so just 9 years. Funny thing is, when I saw the title “Endless Mine (1000 Miles)” I knew it was going to be a higher-quality version of the midi. For those curious, I’m referring to this http://www.vgmusic.com/music/console/sega/genesis/s3vs_vc1000_rmx_ztp.mid Nice to see that something from 2003 is getting acknowledged. Oh my god yes Conveyors ‘n’ Spikes has Gamma’s theme in it. I love you Gregzilla. Can anyone tell me what the second song is in Checkered Emerald Path? I swear I know it but I can’t think of the name. As the composer/arranger of the piece, I think you mean Splash Hill Act 3 – Sunset Dash from Sonic the Hedgehog 4: Episode I, right? Or do you mean the short staccato transition that leads Neo Green Hill into Splash Hill, which is only about 2 seconds of Sonic the Hedgehog 3 & Knuckles‘ Mushroom Hill? Is there an instrumental version of mind body soul? This album is absolutely fantastic!